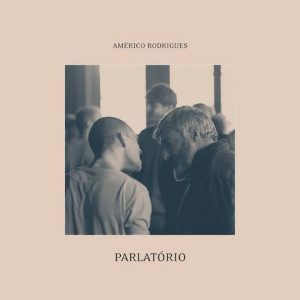 ”Parlatório” is Américo Rodrigues’ most recent sound poetry recording. Although it is based on conversations had with seven inmates, it is not a documentary record: “A year ago I interviewed seven inmates to hear their life story. The initial idea was to write a book with stories of those women and men who were serving their sentence in a penitentiary in the interior part of Portugal. I wrote in several notebooks the most important things they told me (statements of great authenticity), underlining sentences and linking words with arrows and other graphs. What I wrote was what I considered to be the essence of what I heard. Stories of robberies, traffic, scams, robberies, addictions, betrayals, violence, death. Lives. From this base material, I conceived a piece of sound poetry that crosses my vocality (shouting, whispering, crying, non-existent languages, noises, ethnic-inspired chants, tongue clickings, phonetic terrorism, etc.) with those notes taken of the conversation with the inmates (white reading, theatrical interpretation, mistakes, hesitations, speed changing, silences, amalgams, etc.). “Parlatório” was borne out of a partnership with José Neves (sound dramaturgy and editing), with the collaboration of Nuno Veiga (sound designer), César Prata (recording) and Tiago Rodrigues (graphic design). A Bosq-íman:os the records.